The National Catchment Flood Risk Assessment and Management (CFRAM) Programme was developed to meet the requirements of the EU Floods Directive (2007/60/EC), as well as to deliver on core components of the 2004 National Flood Policy. 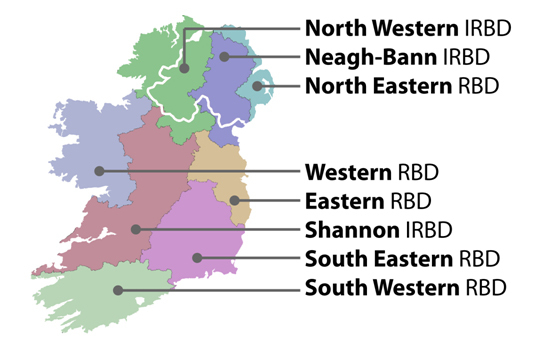 Pilot CFRAM studies have been undertaken since 2006 in the Dodder and Tolka catchments, the Lee Catchment, the Suir Catchment and in the Fingal/East Meath area. In 2011, CFRAM studies were commissioned at the scale of the River Basin Districts. The CFRAM Programme is central to the medium to long-term strategy for the reduction and management of flood risk in Ireland. Implementation of the requirements of the EU Floods Directive is being coordinated with the requirements of the EU Water Framework Directive (2000/60/EC) and the current River Basin Management Plans 2009-2015. The Programme is also being undertaken with close cross-border coordination. The Programme provides for consultation with stakeholders and interested parties. Click here have your say if you wish to make a submission or here Consultation Events to see what events are happening in your area.